The DV-DTR1, also known as the GiGo, is billed by its maker, Digital Vision, as 'today's digital VCR replacement', and is aimed largely at those who haven't yet upgraded their old video deck to a DVD recorder or PVR. The company is an expert in encouraging people to improve their technology, as it's working with Digital UK to ensure a smooth switchover to digital TV, paying particular attention to more elderly consumers who may need a bit of guidance. Designed primarily for ease of use, the device is equipped with three USB ports, enabling you to record to flash memory or, alternatively, onto an external USB-equipped hard disk drive. Furnished with an eight-day EPG, the box enables you to set a favourites list and there's also a parental control feature. As well as recording and playing back digital TV, you can watch one recording while making another, and also copy recordings from one USB drive to another. And you can also pause live TV. What's more, you can transfer the recording to a computer, via USB, where they can then be copied onto your computer's hard disk. However, as there's only one tuner, you won't be able to watch one channel while recording another, and neither will you be able to record two channels at once. And if you're still reluctant to let go of your old VHS deck, it can be routed via the DV-DTR1 for playback or recording onto tape. The build quality of the unit is fairly atrocious, particularly the cheap black plastic casing, which was covered with fingerprints the second it was out of the box. Although, in fairness, the unit has been designed to suit the inexpensive end of the mass market, so a classy finish was obviously not top of the agenda. 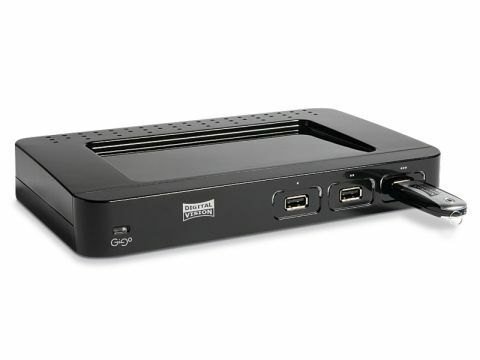 The unit is connected to your television using a Scart lead, and there's no HDMI port, so any kind of upscaling is out of the question. There's no component input, either, making Scart the only choice. The EPG is far better than you've any right to expect at this price. We were bowled over by the design, which is clear and bright and features large text, making it one of the most friendly user interfaces we've seen. In fact, it's better than some on far more expensive rivals. Making recordings is a doddle and they are easily retrieved without the need to scroll through pages of lists. Setting recordings is fuss-free, and the box will even suggest other times to record your chosen programme if it's being show more than once in a day. There are three dedicated buttons on the remote to start recording from any of the flash memory ports with a single click. Once the USB stick is inserted, a green light appears to signal its readiness to record. However, this light is so small and weak, that it's almost impossible to see in a well-lit room. Not a good sign, particularly considering the target market. The remote control is surprisingly weighty, but actually extremely comfortable with responsive buttons. There is also a dedicated 'help' button which brings up a clear and simple menu of instructions. The only criticism we have is that some of the labelling on the buttons is rather small and, again, could prove difficult to read for the market sector it purports to target. Things don't start well, with the initial channel scanning screen not appearing automatically as described in the Quick Start guide. Only after manually selecting the AV input using the TV's menu, were we finally ready to begin. The first thing we notice after the scan is complete is the rather low quality of the pictures, even considering the inevitably shoddy nature of most Freeview broadcasts. Images are soft with blurred edges and a slightly bleached-out look. There is judder on fast-paced images and also some blockiness. Swapping the hideously cheap Scart cable supplied for a higher quality lead, the picture did see some improvement, particularly in terms of picture sharpness. Despite the decidedly average quality of the initial Freeview pictures, recordings on the DV-DTR1 do look exactly the same as the original broadcast, with no loss of picture quality during the recording process. There's not a great deal to say about the sound. As per the pictures, the original audio track from the TV broadcasts are reproduced without any significant loss in quality. As a result, the audio performance is only as good as the speakers through which it's being played. On the whole, this product is a smart choice for its target market of elderly consumers, thanks to its simplicity and large onscreen text, even if the remote buttons are somewhat challenging. The benefits also make it ideal for technophobes who are taking the fi rst step towards digital after being prised away from their VHS decks. The use of USB sticks also makes this a compelling product for those that wish to watch their recordings on a computer, particularly on a laptop while out and about. So if you fall into either of these categories and you want a product that is easy to use, then this gadget is ideal, especially given its ultra affordable price tag of just £70. However, we would recommend that you shell out a little extra on a better Scart cable than the one that comes supplied.